PICKERINGTON, Ohio — The American Motorcyclist Association today announced the 10 Trophy Team riders selected to represent the United States in the 2017 FIM International Six Days Enduro in Breive, France, on Aug. 28 through Sept. 2. The riders will compete as the U.S. Trophy, Junior Trophy and Women’s Trophy teams. The 2017 U.S. World Trophy Team includes: Taylor Robert from Scottsdale, Ariz.; Kailub Russell from Kingston, Ohio; Thad Duvall from Williamstown, W.Va.; and Ryan Sipes from Flaherty, Ky.
Russell, Robert, Duvall and Sipes also were named to the U.S. World Trophy Team together in 2015, when Sipes was the top individual rider at the ISDE. Robert was the top individual rider at the 2016 event. The U.S. Junior Trophy team is made up of riders 23 and younger. For 2017, the U.S. Junior Trophy team includes: Grant Baylor from Belton, S.C.; Layne Michael from Fairmont, W.Va.; and Josh Toth from Winsted, Conn. The 2017 U.S. Women’s Trophy Team includes: Kacy Martinez from Sunol, Calif.; Becca Sheets from Columbus, Ohio; and Brandy Richards from Lake Havasu City, Ariz. These riders will be joined by 21 Club Team riders at the ISDE. 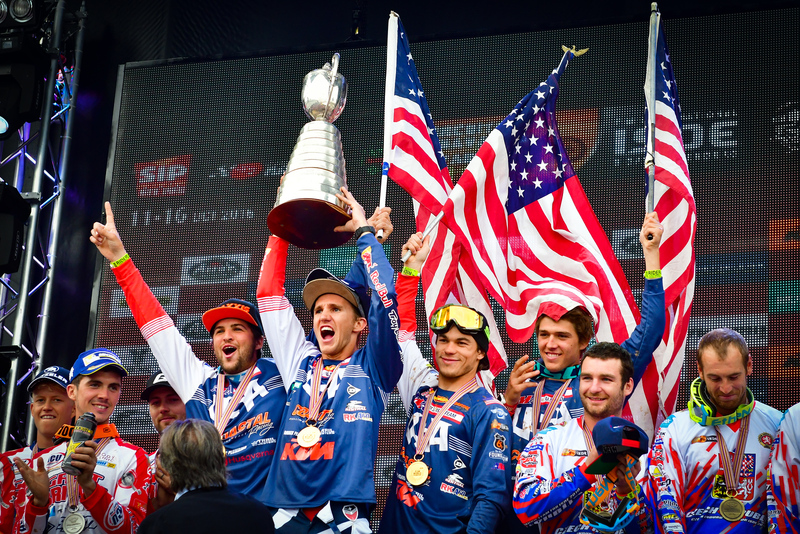 The U.S. ISDE World and Junior Trophy Teams have been managed by KTM USA’s Off-Road Manager Antti Kallonen since 2012. For 2017, Kallonen will take on the additional challenge of managing the U.S. Women’s Trophy Team. Riders at the ISDE compete in one of three displacement classes. The E1 class features 100cc to 125cc two-stroke and 175cc to 250cc four-stroke motorcycles. The E2 class features 175cc to 250cc two-stroke and 290cc to 450cc four-stroke motorcycles. The E3 class features 290cc to 500cc two-stroke and 475cc to 650cc four-stroke motorcycles. The team’s efforts would not be possible without the help of many sponsors including Coastal Racing, FMF and Bonanza Plumbing. Riders are supported by individual manufacturer and product sponsors. Direct team sponsors include: Rabaconda, Seat Concepts, Trail Jesters, Arai Helmets, Spectro, Motion Pro, Hall’s Cycles and Elizabeth Scott Community. Fans can show their support by buying ISDE U.S. team apparel at www.amagear.com.